Relau Star, who found one to beat in the first heat of the 2018 Malaysia Three-Year-Old Championship in Penang on 6 May, looks set to make amends in the second heat to be held here this Sunday. 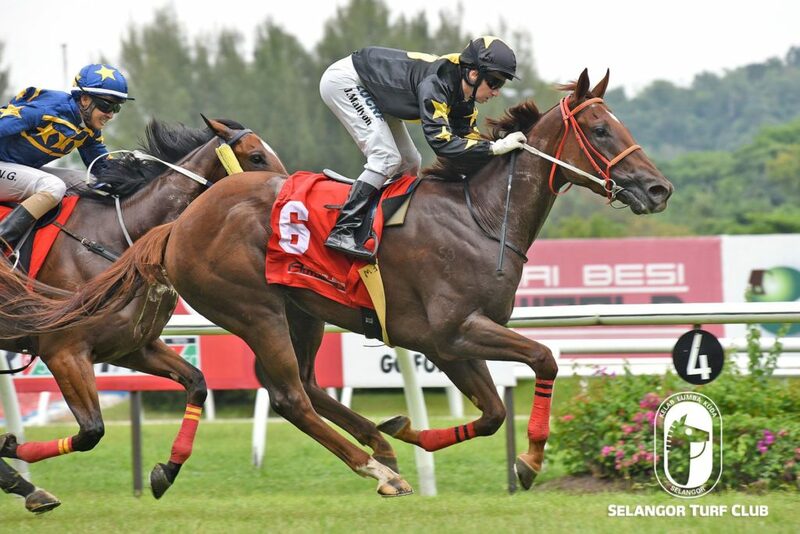 Relau Star (Captain Sonador – Shovella by Shovhog) attempted to make all the running in Penang and looked all over the winner until Sakura Japan got up in the last couple of strides to beat him by a head. With home ground advantage this time, he will take some beating. Purchased by his trainer Wong Kong Fatt for A$25,000 at the Horses In Training Sale, Relau Star was unbeaten in his first three outings. After three more runs, the chestnut gelding is back in form with two wins and two seconds in his last four starts. Two starts back, Relau Star easily accounted for a Class 3 field over 1200m at Sungei Besi, covering the distance in a smart 1 min. 9.5 secs. The main challenges could come from Always D’Great, who finished fifth in Penang, last-start winner Step By Step and Triple One D’Great. Bought for just NZ$15,000 as a yearling, Always D’Great (Iffraaj – Sundown by Generous) was placed in four of his first five starts. The gelding then improved tremendously to win three of his last five runs, including a double in Cosmo D company and Class 4 during the Ipoh meeting in April. He lost no marks with his run in Penang. He was desperately trying to close the gap behind the leader Relau Star in the home stretch when he was hampered by another runner and lost his momentum. After an unplaced debut, Step By Step (Captain Gerrard – American Morsecode by All Chatter), raised his game to win an Open Maiden event three weeks ago and should improve from the run. The gelding raced thrice in Australia for a third and a fourth before coming to Malaysia. Triple One D’Great (Beautiful Crown – Fresh Tracks by Bianconi) is a three-time winner in 14 starts but after his last victory in November, he was unplaced in four starts this year before showing a return to form with a third-place finish in Class 4 in April. The gelding was bought for just A$20,000 at the 2YO Horses In Training sale. Watch out too for RA Force (Mossman – Hearts Will by Show A Heart). The Australian gelding was unplaced in one run in Singapore and after a lapse of 12 months, put up an eye-catching show in the first heat in Penang to finish fourth. Well back of the field at the top of the straight, RA Force was putting on “wings” in the final 150m and could have finish in the placings had he not have to steady at a crucial stage. RA Force has only to step up on that effort to pose a threat. The field for the second heat may be smaller than the first, but by no means less competitive on paper. The final heat will be held at Sungei Besi on 15 July and then Penang Turf Club will host the Championship Final on 28 July.